My name is Adele, and I’d like to invite you to come with me into the deep woods where Sammy the skunk becomes a hero to the animals that live there. 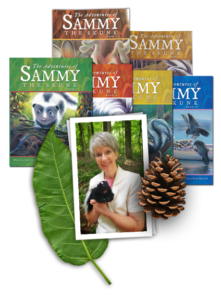 When Sammy finds out Mrs. Porcupine has quil-la-ti-tus-i-tus, Mr. Beaver loses his teeth, little rabbit breaks his leg, the animals get caught in a mudslide, and there is a fire in the deep woods, what will Sammy do? 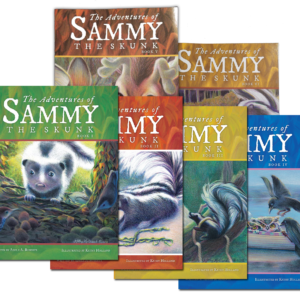 These are only five of the twelve occasions where Sammy is called upon by his friends to help them. At the end of each story, there are Life Lessons which includes a question for children to think about, a scripture verse, a truth about God, and a short message about the love God has for His children. Thank you for blessing the students and staff with your inspiring stories. We thank God that you have shared your talents and God's Word with many. I would like to thank you so much for coming to our classroom to read your lovely books. The children enjoyed it and so did I. We are already enjoying the books in our classroom. Thank you for encouraging the love of reading to young children. We wish to extend a special thank you. We are grateful for your willingness to be a friend of the children of our community. Your memorable characters and beautiful reading voice are so charming. Loved your story. It is a delight, and illustrations are excellent. Please send me two more for me to share with my writers group. Tell Adele the book she gave me is providential! We have real little kids, and kids that don't pay attention at all - at least for a long time, and the night I started reading the book was the first time they sat that still for two days! Tell her "thank you so much! Feel free to contact Adele if you are interested in any of her books or you would like to schedule her for an event. Copyright 2017 Sammy the Skunk. All Rights Reserved.